Manhattan gets all the New York hype, but Brooklyn is just as worthy of a visit. For a little more hipster culture and a little less hustle and bustle, Brooklyn is this summer’s NYC destination. Visit in the summer when the weather is warmer and the nights are longer. Enjoy live music, walk around and see street art, and experience food like only New Yorkers can prepare it. 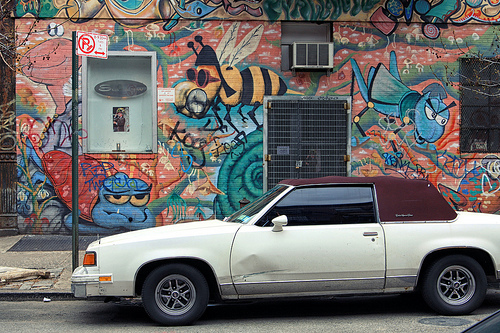 Image via Flickr by James Ian L.A.
Head to Bushwick to get the biggest infusion of street art in Brooklyn. You can take self-guided walking tours that locals and travelers have compiled, which will direct you to the must-see murals and pieces of artwork. The best part is that they’re on the sides of buildings that house delicious restaurants and excellent shops to visit, too. Your walking tour can turn into an all-day Brooklyn exploration if you want. Greenpoint and Bushwick are both full of fantastic music venues, both big and small. Though people think of Brooklyn as a huge hipster scene, you can find tons of music options when you visit. With a little research, you’ll discover lots of exciting venues to experience. Spots like the Manhattan Inn offer a wide array of genres, from jazz to R&B to karaoke nights, while some places are very specific to a genre, like Saint Vitrius for metal. Want a pro tip? Book your Brooklyn hotel near the venue you want to see the most. That way you can stay out late listening to music, but you won’t be far from your bed. You can almost always find a good restaurant no matter where you travel. Brooklyn, of course, is full of delicious options. But when you’re visiting a metropolitan area so vast, hunt down something a little more unique. You have to stop at a few food trucks while you’re visiting Brooklyn in the summer. Grab your food, then sit down at a nearby park to enjoy your lunch and the weather. If food trucks aren’t your thing, try stopping at Juliana’s or Motorino for a delicious slice of pizza. For an upscale culinary excursion, try Aska, a Michelin-starred restaurant run by a Scandinavian chef. Both Prospect Park and the Brooklyn Botanic Garden are well worth a visit during the summer. Prospect Park spans almost 600 acres. It has a lake, a forest, and a zoo within its boundaries. Plus, you’ll often find some kind of festival happening here. The Brooklyn Botanic Garden features 58 acres of gorgeous plants. More than 10,000 species are there for you to check out, and summer is the perfect time to see many of these exotic flowers in full bloom. In a borough so big, your options are nearly endless, so a summer vacation to Brooklyn can be exactly the kind of trip you’re craving. Whether you want late nights or you prefer cultured days, you can find both and so much more in Brooklyn. Be the first to comment on "4 Reasons to Visit Brooklyn This Summer"